My favourite type of seafood is crab, which can be classified into two varieties – the lagoon crab and the sea crab. Most people prefer the lagoon crab as it is larger has more flesh and some claim it is tastier. I personally prefer the sea crab as it is mush easier to handle, and moreover, the lagoon crab is alive when you bring it to your home and you have to end its life, on your stove, in your own kitchen! Nope, not for me thank you! You can buy decent sea crab in most fish markets or supermarkets, but before cooking it must be cleaned thoroughly and all organs have to be removed. 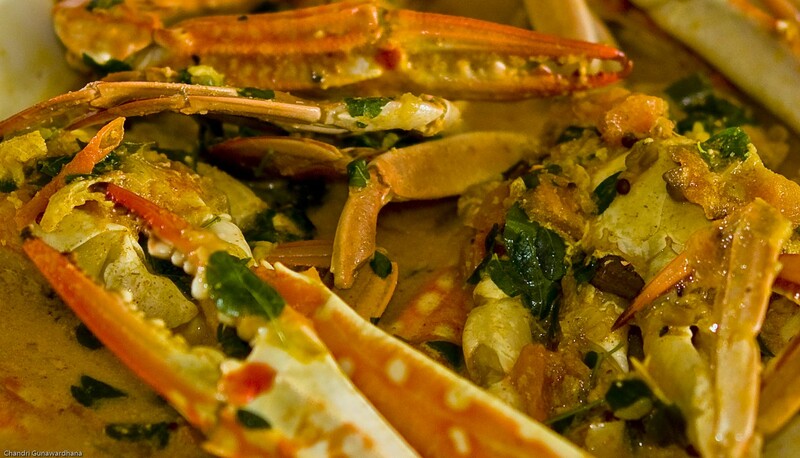 Baked crab, Singapore Chili crab, and crab curry are some popular dishes. My favourite is the spicy Sri Lankan crab curry cooked with drumstick leaves. It is so flavoursome that you do not need many accompaniments, except for steamed rice and perhaps a single vegetable dish, sauteed dry. I sometimes toss a few iceberg lettuce leaves splashed in simple home made vinaigrette dressing, or add a simple cucumber salad, as two side dishes, to make it a complete picture without deviating too much from the central flavour of the crab, and ofcourse to cool the spiciness of the curry!